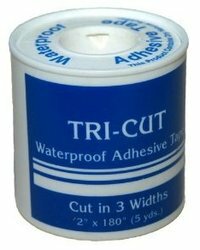 Medi-First Tri-Cut Waterproof Adhesive Tape. Be prepared to handle any minor first aid situation. Each roll contains 3 different sized adhesive tape. There are 5 yards of the 3/8 in., 5 yards of the 5/8 in. and 5 yards of the 1 in. Medi-First Tri-Cut Waterproof adhesive tape. Each roll contains 3 different sizes of waterproof adhesive tape. There are 5 yards each of the 3/8, 5/8 and 1 inch.